PayPal is a great way to donate without disclosing your financial information. 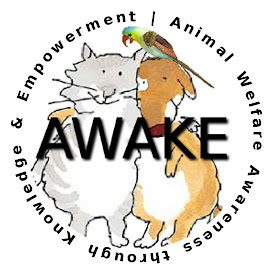 It is completely secure, and you do not have to join in order to make a donation to AWAKE. Just click on the link below, and you will be led through a very simple process which will allow you to donate any amount that you wish. I thank you for your support! Update: I used to have a link here that would let you donate directly to Our Animal Haus, but since its destruction, the only PayPal button I have is on my music page. You will easily see the PayPal button on my home page, and while you are there, why not take the time to explore my music? All of the video and audio content is free to download as a show of appreciation for your continued support. Your donations will help me keep this page alive. and also go towards helping me get my case heard in court.